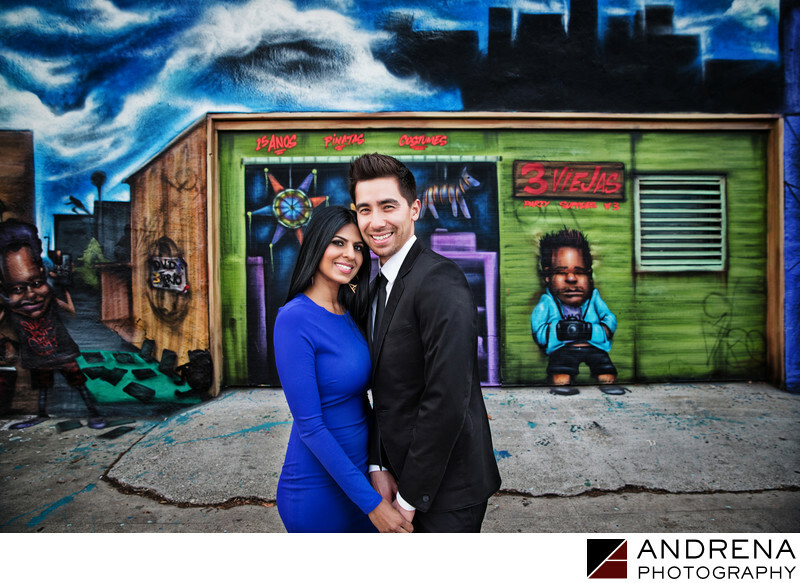 Venice provides a fantastic array of locations for engagement sessions, which means that wedding photographers can provide their clients with an endless variety of backgrounds. One of the great things about working in certain Los Angeles neighborhoods is that they are always changing. In some neighborhoods, the walls will be yellow one day, and two weeks later, have a full graffiti mural instead. I love the living, breathing aspect of this ever-changing city. This particular mural had such a three-dimensional look to it. The little guy on the right is also wearing a camera around his neck. I did a bunch of Photoshop to enhance the 3D part of this painting, and love the end result.